It's miraculous that I even got a resemblance of fudge. It is the old fashion kind that you have to stir at the end to loose the gloss. First I burned the first batch, so I had to start over. Second, it did not want to cook to the soft ball stage, maybe my candy thermometer is broken. So I took a chance after cooking for while, and let it cool for the final mixing stage. Then I mixed for a really long time, remained glossy, so I gave up on it for while. 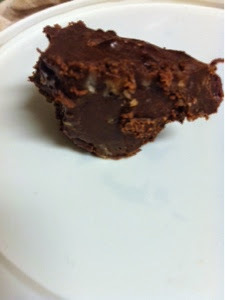 Then I thought I would reheat it, a layer of fudge just got hard on the bottom of the pan. I finally gave up, salvaged what I could, put it in the fridge, and went to bed. 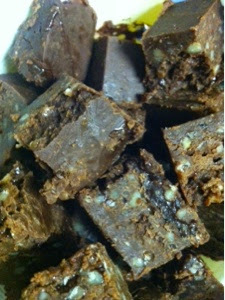 In the morning, I was surprised to find that my fudge actually looked and tasted like fudge. Julie this looks like delicious Fudge. Thanks so much for sharing this awesome recipe with our special edition of Full Plate Thursday. Hope you are enjoying your holidays and look forward to seeing you soon!